We’re heading way up north this summer to explore the farthest reaches of the Great Lakes. We’ll visit Wisconsin and Minnesota before looping around Lake Superior in Ontario and returning through the upper and lower peninsulas of Michigan. The initial route idea was conceived last fall, and we’ve spent the spring getting our lodging and transit reservations locked into place. In these last few weeks before we take off, we’re loading up on camping gear and researching details of the various parks we’ll visit. 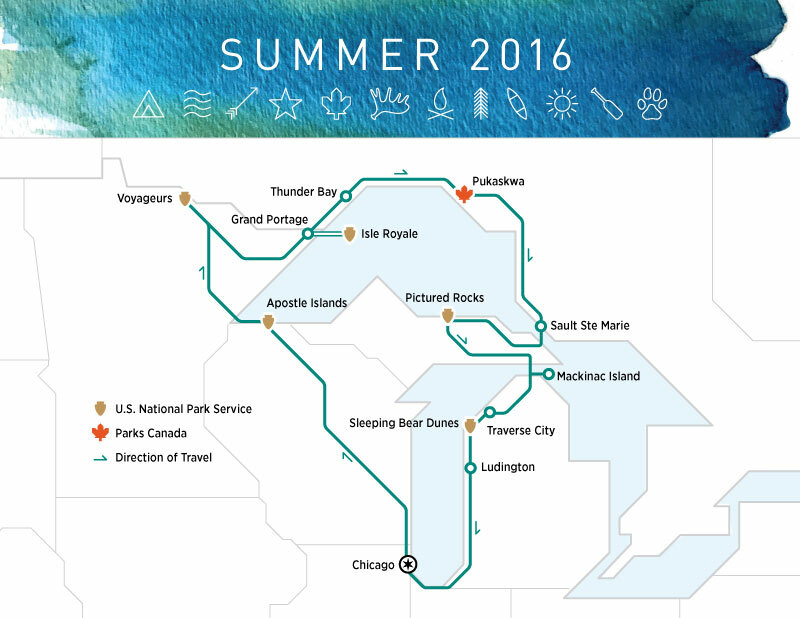 The first leg will take us from Chicago to Apostle Islands National Lakeshore. We’ve booked a late afternoon sightseeing cruise through this scenic area of islands in Lake Superior at the northernmost tip of Wisconsin. After overnighting in Bayfield, we’ll spend the next day getting to Voyageurs National Park at the Minnesota/Canada border. We’ll spend three nights in a rustic lodge on the shores of Lake Kabetogama, exploring the park via canoe, kayak or motorboat in addition to a ranger-led boat cruise. This land of intricate waterways and islands is one of the most remote areas in the continental U.S. and full of wildlife sighting opportunities. After Voyageurs, the next stop is one we’ve been wanting to visit for a long time, Isle Royale National Park. It is a little-known and rarely-visited park on a narrow 45-mile-long island in Lake Superior. Access is only by float plane or ferry boat and there are very few services on the island. A lot of our preparation is focused on our three nights of backcountry camping here. We’ve never camped together before, so we’re doing a lot of research and buying a lot of gear (we’re practicing with a night of camping in Wisconsin over the Independence Day weekend). We’ll arrive via the ferry from Grand Portage, Minnesota and get dropped off at McCargoe Cove. Three days later, we’ll have made our way to Rock Harbor Lodge where we’ll catch another boat back to Minnesota. We’re really excited to experience the pristine environment while completely cut off from the outside world for a few days. Camping experience could add a new dimension to all our future national park visits. We’ll see. When we return to mainland, the plan is to cross the border into Ontario at Grand Portage, ending up in Thunder Bay for an evening in civilization. Then we’ll spend a day leisurely making our way across the northern shore of Lake Superior, stopping at various points of interest and scenery along the way. That night will be spent at a small guest house just outside of Canada’s Pukaskwa National Park. It’s the largest park in Ontario and is primarily wilderness, protecting the longest stretch of undeveloped Great Lakes shoreline. The Pukaskwa Coastal Trail runs nearly 40 miles south from the visitor center, but we are just planning on an “out and back” day hike at least as far as a suspension bridge over the White River. The next overnight stop will be in the border town of Sault Ste. Marie, before we cross back into the U.S. and spend some time in Michigan’s Upper Peninsula. Our plans get a little more flexible at this point, with only lodging booked for now. We’ll take the last several days of the trip as they come. Pictured Rocks National Lakeshore will be another evening scenic boat cruise and we’re thinking of making a day trip over to carless Macinac Island for some biking. The town of Traverse City has come up on lots of lists of best places to visit, so we’ll set up there for two nights to explore the vineyards, breweries and food scene it is known for. Also, the third National Lakeshore we’ll visit, Sleeping Bear Dunes, is nearby. One last overnight town we’ve reserved is Ludington before we head home to Chicago. So those are our big summer plans in a nutshell. After this trip, we’ll have visited all the mainland national parks east of the Mississippi River, our first Canadian National Park and hopefully survived three nights in a tent in the wilderness. Keep an eye out for posts detailing the parks we’ll visit. We’ll also be appreciative of any tips and recommendations from travelers who’ve been to these places before. This entry was posted in Destinations, Maps, Upcoming Travel and tagged Apostle Islands, Grand Portage, Great Lakes Road Trip, Isle Royale National Park, Michigan National Parks, Michigan Road Trip, Pictured Rocks, Pukaskwa National Park, Sault Ste. Marie, Sleeping Bear Dunes, Thunder Bay, Voyageurs National Park. Bookmark the permalink.